The installation process for Simple Desktop Display Manager (SDDM) on Ubuntu and Mint is easy, it is already included into their PPA repository. Launch your system terminal and run following command to add its PPA to your system package manager. Now run following command to update your package manager respository. That’s it, simply run following command to start the installation process for SDDM. During the installation process, it will launch the configuration wizard. Hit “Ok” from here. 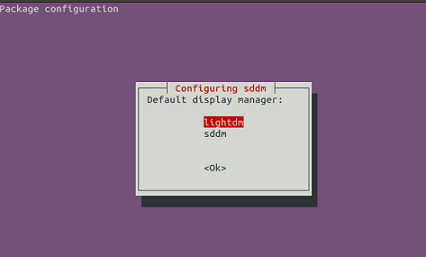 You can set SDDM to be the default display manager from here. If you don’t set SDDM as default manager from this step, you will need to choose it from Logon screen to start SDDM based X11 session. Congratulations, SDDM has been installed, reboot your system and start using this wonderful display manager. Many popular Linux distros and desktop environments are getting ready to equip themselves with SDDM in future. Hopefully, LXQt should be the very first one of those to adopt it. Try it out today, hope you will enjoy its simplicity and power.